This Blueberry Croissant Puff is made from buttery croissants, fruit, and a cream cheese milk mixture that is baked until golden brown. Beat cream cheese, sugar, eggs and vanilla in medium bowl with electric mixer until well blended. Gradually add milk, beating well after each addition. Pour evenly over croissant pieces. Let stand 20 minutes or soak overnight. Bake at 350°F for 35 to 40 minutes or until set in center and golden brown. You may want to cover it with foil for the last 10 minutes if the tops are getting too browned. 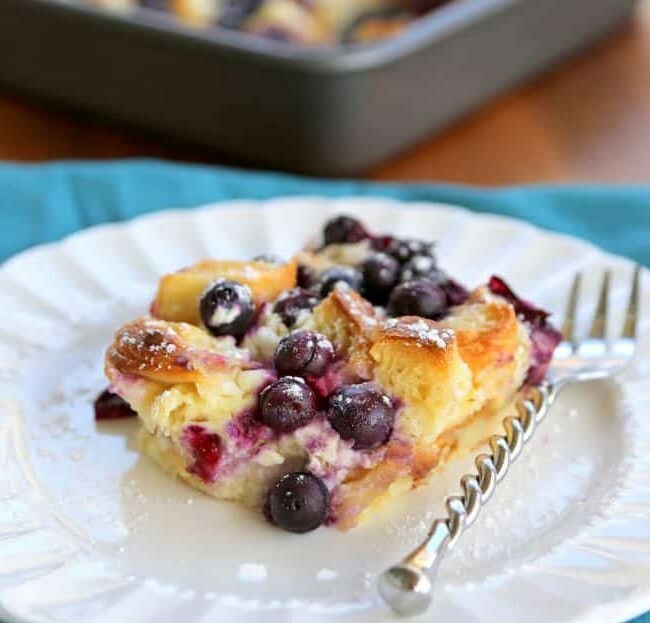 Variation: Instead of baking in a square pan bake individually. Place croissant pieces evenly in 10 (1/2-cup) ramekins; sprinkle with blueberries and pour cream cheese mixture evenly over croissant pieces. Let stand 20 minutes. Bake at 350°F for 20 to 25 minutes or until set in center and golden brown. This can easily be doubled in a 9X13 pan.